One of the best things about blogging is the endless possibilities of where it might take you. Well this weekend my blog took me to France a park in Preston, followed by a quiet room at home where I tried to think of as many references to Allo Allo as I could. I know, I know, she wears a Beret and starts making crude references to France. It's very cliché, but I couldn't resist(ance). Ok, so how am I going to work 'The Fallen Madonna with the Big Boobies' into this post? and don't get me started on 'Dicky Ticker'! Perhaps my chosen theme is a touch over ambitious. I will however say this, and yes yes, I will say this only once... 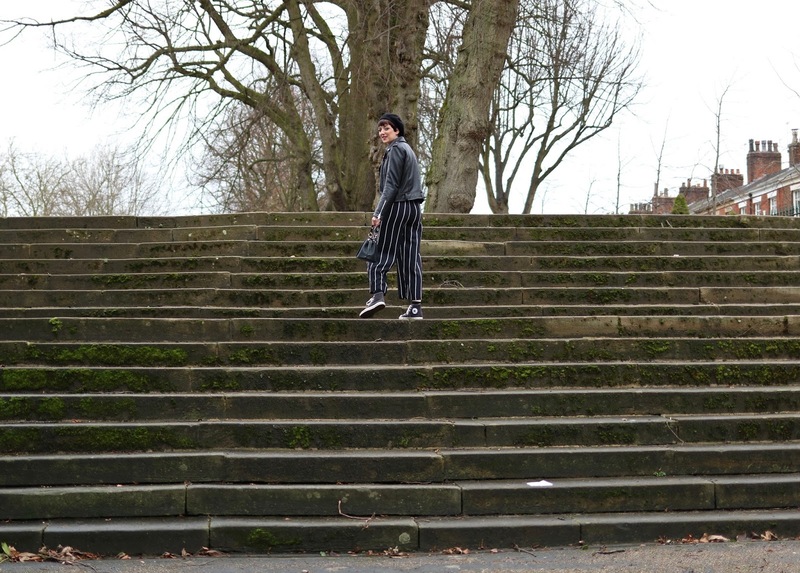 I'm pretty keen on these striped trousers from New Look. 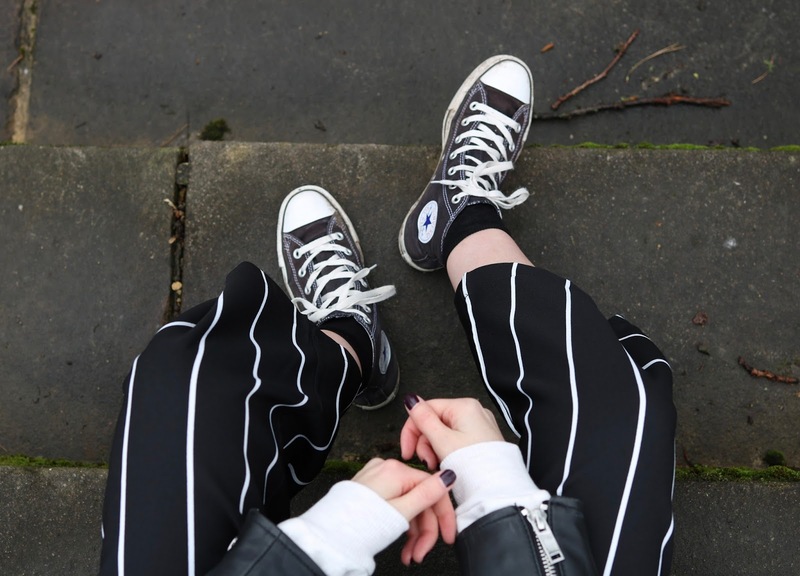 They are the most comfortable trousers ever known to man and ideal for laid back Saturdays (and Sundays) (and possibly in the office on weekdays tbh). 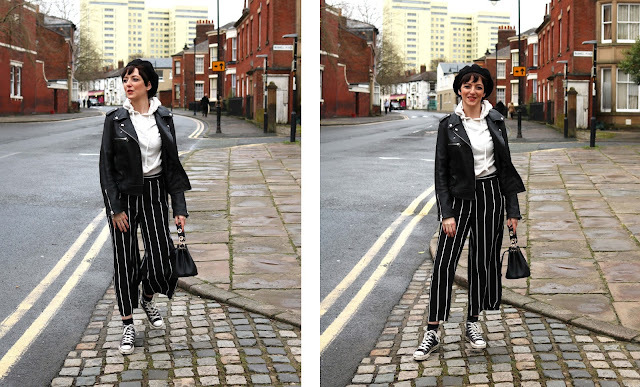 Reasons to love these trousers include, it feels like you're wearing pyjamas, they have a stretchy waist AND they are an absolute bargain at £12.99! I should be on commission. I'll be honest, I haven't been a big shopper at New Look over the years, but they seem to have turned a corner lately. I've seen some pretty nice things recently that don't break the bank or your NY resolution to be more careful with money this year! I wore the trousers with this cropped hoodie, leather jacket and age old Converse to continue my look of 'ultimate comfort but not too slovenly.' I don't know about you, but I'm still slightly in hibernation mode. I bought the beret recently because I'm changing my name to Miiiichelle attempting to grow out my hair this year, and hats will be my saviour during the process. It also makes me feel slightly continental, but then you've probably guessed that by now. Oh to be Parisian and effortlessly chic. Do French girls ever day dream about lazy days in Lancashire I wonder? Aye, Appen they do.